Bologna, Italy — July 30, 2018 — Symach announced today that it has formed a strategic partnership with DCR (Diversified Collision Repair) Systems. As part of the new collaboration, the two companies will combine their strengths to build what Symach CEO Osvaldo Bergaglio refers to as “tomorrow’s workshop.” “It’s clearly a relationship that will allow us to develop tomorrow’s workshops and utilize the strengths of each company not only to put together the ‘super shop’ but also the ‘super team’ to operate it,” said Michael Giarrizzo, CEO and president of DCR Systems. “DCR uses a fantastic process-based production system that standardizes and streamlines each procedure and eliminates many of the inefficiencies associated with auto body repairs,” said Bergaglio. “It is very complementary to the Symach system and we are really excited about working together. 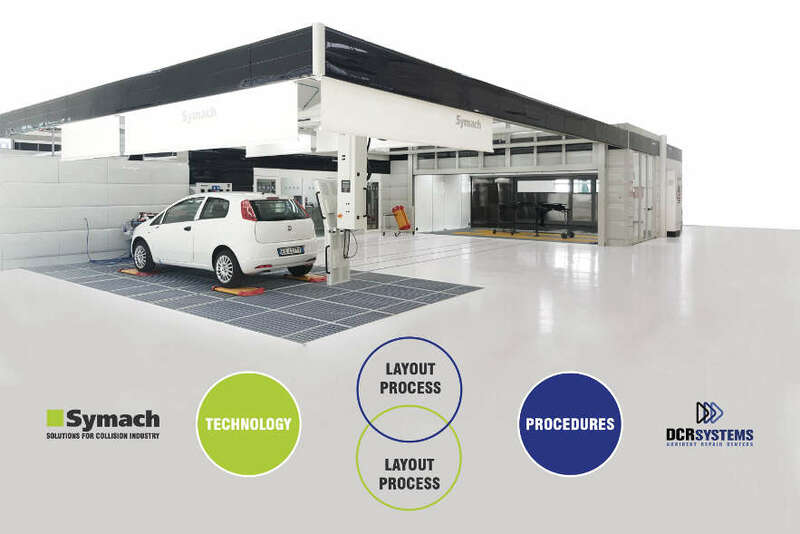 Founded in 2001, Symach offers a complete range of body shop equipment for the collision repair industry, including its unique FixLine repair process, SPAP “Symach Paint Application Process” and DryTronic robotic technology for drying paint in a less than a minute. DCR Systems was founded in 2004 and is owned by Giarrizzo and partners. The Ohio and Atlanta-based business sets up accident repair facilities based on lean manufacturing principles for automotive dealerships looking to outsource their operations. Moving forward, Symach plans to sell new collision repair facilities in the USA market that will operate under the DCR standard model. In addition, DCR Systems will offer a turn-key franchise-like model for dealers. In both scenarios, Symach equipment will be utilized and training will be provided. When Giarrizzo first met Bergaglio a couple of years ago, he said he was impressed with the robotics technology being designed, manufactured and sold by the Italian-based company. The two business owners spent time in body shops set up by DCR Systems as well as some recent installations by Symach in Canada. The business owners soon discovered the commonalities of the two companies. For example, the DCR System’s proprietary model involves the layout of the rail system, which allows vehicles to move through the paint line. This is very similar to what Symach does as well in its layout process. “It was really eye-opening seeing what the company has already done,” said Giarrizzo. 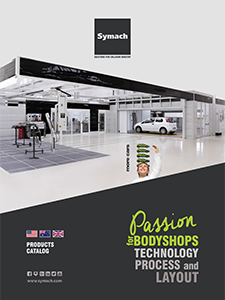 “We started to feel the synergy between the two companies.” Both Symach and DCR Systems focus on continuous workflow in the body shop and a process-centered environment. The goal is to ensure the team understands the required pace so that the steps of the process are interdependent and have to work in sequence. The desired outcome is to have all of the vehicles go through the shop interrupted and ensure they are repaired in a very predictable amount of time. “DCR Systems specializes in fostering a team environment with very strict validation stages that maximizes touch time and minimizes waste,” said Bergaglio. “It’s about speed and first-time quality, so nothing has to be redone.” “As an industry, we can never stop seeking improvement not only in technology, but also in the way we do work,” said Giarrizzo. “This is truly tomorrow’s technology and groundbreaking for the industry. The folks at Symach are innovators—they are engineers and inventors and so are we, making it a powerful relationship.” About Symach: Symach was founded by Osvaldo Bergaglio in 2001. The Italian-based company offers a complete range of body shop equipment for the collision repair industry, including its unique FixLine repair process, SPP “Symach Paint Process” and DryTronic technology for drying paint in a less than a minute. About DCR Systems: Founded in 2004, DCR Systems is based in Ohio and Atlanta and is owned by Michael Giarrizzo and partners. The company sets up accident repair facilities based on lean manufacturing principles for automotive dealerships looking to outsource their operations.